Here are tips for how to organize photos the easy way, for both digital and physical photographs, by setting up a regular routine so the task is never overwhelming, and instead stays fun and enjoyable. 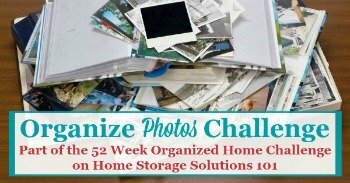 This week, as part of the 52 Week Organized Home Challenge, we're focused on the Organize Photos Challenge, and there are really two parts to this challenge. One part is to deal with all of the old photos that have accumulated, perhaps over decades, that need to be organized in some fashion so they can be enjoyed. Depending on how many of these physical photos, or digital photos you've got, this can take quite a long time, and can feel like quite an overwheling task. We'll work on that, I promise, but today we're focused on the second part which is to allow you to begin making progress now, as newer photos are taken. Today, as the second part of that challenge, I want you to set up a system and routine using the tips in this article to sort and organize photos you are taking, on a regular basis, so the overwhelming pile stops growing larger and you can enjoy your photos immediately from now on. In the past the reason that your photo piles (either physical or digital) kept accumulating is because the task already looked overwhelming. That's because there were already so many photos, from such a big time span, that made the task seem too large. As a result the piles continued to grow and grow, making the problem seem more and more insurmountable. Also, as the days, months, and perhaps even years passed your memory for the events and people captured in those photos began to fade, so when you came across the photographs years later, with the idea that you'd organize them, you wondered where the photo was taken, what you were doing in it, when it happened, or even, who are these people? Those questions can be frustrating, and also make it harder to find the motivation to get the photos organized. That's why starting today, if you set up a routine to deal with the photos regularly, you'll make it as easy on yourself as possible to organize your photos, because you'll deal with a much smaller amount of photos each time, so the task seems less daunting. In addition, you'll be much more likely to be able to answer all the relevant questions about the photos, like who, what, when, and where, so you can save that information for posterity. The first thing you need to do is decide on the frequency of your routine, and the two choices I suggest are either weekly or monthly. The right frequency for you depends on how many photos you take regularly. If you only take a few photos a week doing it weekly is probably overkill, and instead I suggest doing it monthly so you do it regularly, and also don't forget too many important details about the photos between organizing sessions. On the other hand, if you take a lot of pictures daily and then wait for a whole month to pass before beginning to organize them you're likely to get overwhelmed by the sheer volume of photos to organize at once, and also be discouraged by how long doing a whole month at once will take, which defeats the purpose of this routine. Therefore, in your case I'd suggest organizing photos weekly so it never is a daunting task, and each organizing session is short enough that you don't avoid it. If you're doing it weekly you can piggyback this photo organizing routine onto the weekly paperwork routine I've suggested (check the link for more details), if that will help you stick to it. If you're doing it monthly choose a regular time, such as the first Saturday of the month, or whatever works for you, and calendar it as an appointment in your planner, so you remember to do it regularly. In addition to doing these regular weekly or monthly photo organizing sesssions, if you attend an event where lots of photos are taken, such as going on a family vacation, or attending a wedding, you should plan some time within a few days of the end of the event to do one of these organizing sessions for that batch of photos. 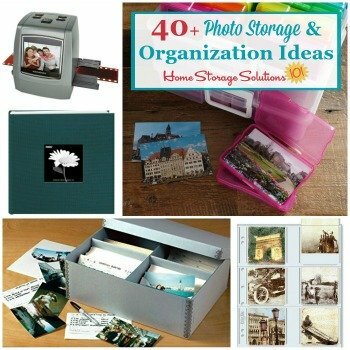 This allows you to organize the photos while the memories are fresh, and also keeps the total volume of photos you've got to organize from getting too large, so you're not discouraged from even getting started because of overwhelm, or the feeling that organizing them will take way too much time. These days most of us take our photos digitally, which means you have to organize them both digitally as well as organize any photos we decide to get printed out. 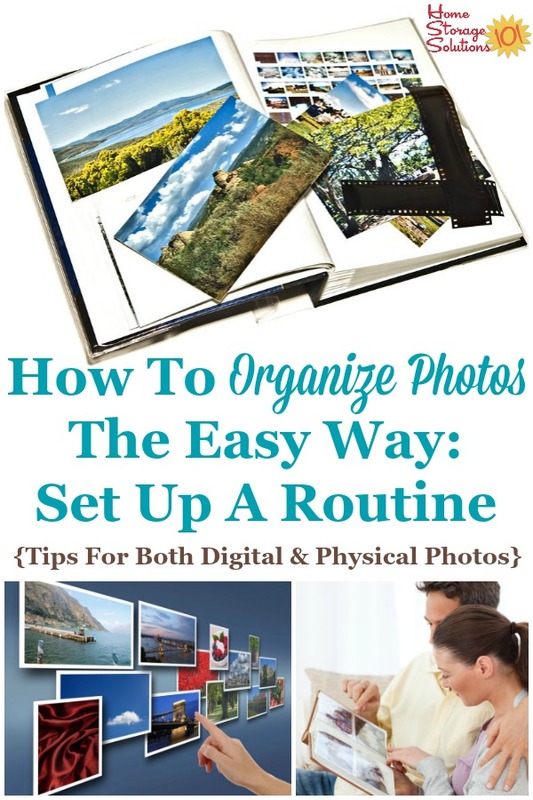 That's why I'm giving you the routine for digital photo organization first, since it contains some preliminary steps to help you organize any physical photos you print out. These are the steps I suggest as part of the routine, but make sure you adapt it however you want, to make sure it works for you. Digital photos are awesome, because they don't take up physical space, but we've all been there when a device has failed, gotten broken, or lost, and we've lost photos. To prevent this problem, at least as much as we can, always have a back up for your digital files, including your photos. A system that backs up automatically is even better, because then you don't have to think about it (I use Dropbox, which you can find out about here). Periodically, even with automatic systems though, you need to make sure they're actually backing everything up. It's better to learn of a problem quickly, and fix it, than to think everything is backing up and it's not, for month and months. So check your back up as part of your routine, to avoid this problem. Putting everything in these folders allows you to find the right photos quickly in the future, since chronological order is the default way our brains remember these types of events and memories. Plus, if creating these folders is all you have time to do, you can be done with the routine after this step, and have at least a rudimentary organization system completed that can help you organize further in the future if you ever want to. As you move your photos into the correct dated folder, you may see some digital photos you want to delete, because they were blurry, or someone's facial expression wasn't good, or your thumb was covering part of the picture. If it's not a good photo delete it now, so the digital photo clutter doesn't accumulate. In addition, as you're looking at that batch of photos you may notice some especially good ones, such as a striking landscape photo you're proud of, or an excellent picture of your spouse or child that captures a great facial expression or makes you smile. Take note of these photos. The beauty of digital photos is that it is super simple to make a copy of them. So go ahead and make a copy, and leave one copy in the dated folder, and then move the other copy to other special folders you've created, such as a folder just to hold the best photos of your family, or certain events, or whatever you want. Segregating out the best of the best digital photos into their own folder(s), along with keeping a copy in the dated folders, makes it easier for you to find your favorite photos later, to print out, show to friends, make into digtial or physical albums, share on social media, or whatever you wish to do with them. You can also write a quick note to yourself about the photos within the dated folder, such as in a Word document, with some journaling or factual information, such as who is in each photo, or where you were, etc., and add the quick note as a document, saved into the folder with those photos. This helps you remember details for later that you might be afraid you'll forget, and keep the information associated with the right photos. Finally, look at the special photos you put into their own digital folders, and decide if you'd like to print any of these out to give away as gifts, add to a physical photo album, or put into a frame around your home. If you only print out some of the best ones it won't be expensive and won't take too long, and you can deal with those few photos easily, without overwhelm. In my house we personally use the Walgreens app to print out photos, since we don't have a photo printer in our house. We found it was cheaper and easier to send them out to Walgreens, and the photos looked better too. We send them in the app, and get notified when they've been printed (it is typically within a few hours), and then can go pick them up at the store close to our house. Easy peasy. If you do print photos out check out the suggested routine below for how to organize those physical photos. Whether you received some photos from somewhere that you want to organize, like school photos or a few pics from a friend, or you printed out photos for yourself from your digital photos, you want to make sure you deal with those physical photos regularly as well. Here are my suggested steps for organizing these physical photos, as part of a routine. These steps are pretty simple, but that's good, because the simpler it is the easier it is, and the more likely you'll do it! The simplest way to organize physical photos is within albums. There are lots of photo albums you can choose from, and they all have their pros and cons. 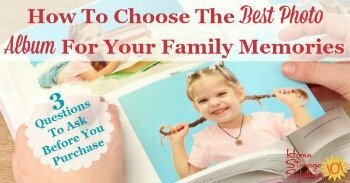 If you haven't already got albums ready to use, make sure to check out my article for how to choose the best photo album for your family memories here, to get good ones that are safe, in the long term, for your precious photos. Once you have photo albums ready and waiting for you to put photos into them, the next step is easy. Since you're dealing with just a few photos from this past week or month it's not hard to put them in chronological order (or however you chose to arrange them) and then place them into the album. In fact, it should take just a few minutes, and then the task is accomplished until the next week or month passes. You can also add some information in the album if you'd like that provides more information about the photos, so later on you remember details that might otherwise fade with time. When your photo organizing routine doesn't take too long it's completely doable, and the result is you will be more likely to get it done, which means you'll enjoy your photos from the very beginning without forgetting special details, and not be overwhelmed by the organizing process. 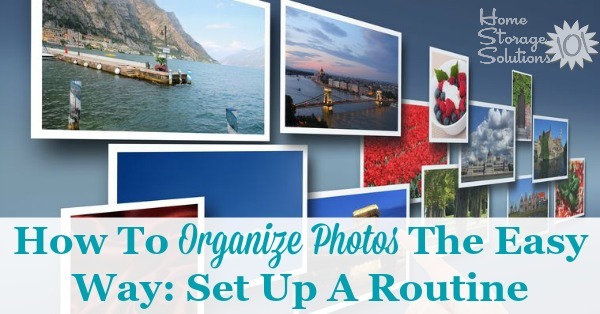 So go ahead and begin these steps for how to organize photos as part of a regular routine today! Here's the Organize Photos Challenge article, which provides you with all the steps you need to do for this organizing challenge. 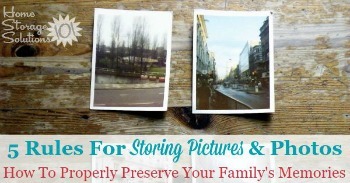 In addition, here are the 5 rules for storing pictures and photos to preserve your family's memories.